This might not end well. An aggressive, superiorly equipped alien enemy will unfailingly seek confrontation to expedite our complete obliteration, so if we are to stand a chance the way to go is reportedly by resorting to the Human Extinction Simulator. Prepare yourself for the inevitable alien invasion in this tactical turn-based space combat game. We are facing overwhelming odds in a direct military conflict with the Navassian extraterrestrial species. All officers have to complete the Halting Extraterrestrials Strategy, or HES, training program. The simulator presents likely combat encounters based upon observed Navassian tactical data from previous engagements. Recruits call this program the Human Extinction Simulator due to the extensive and often catastrophic scenarios depicted. While most find this amusing, some fear that it might be the actual name of the program. 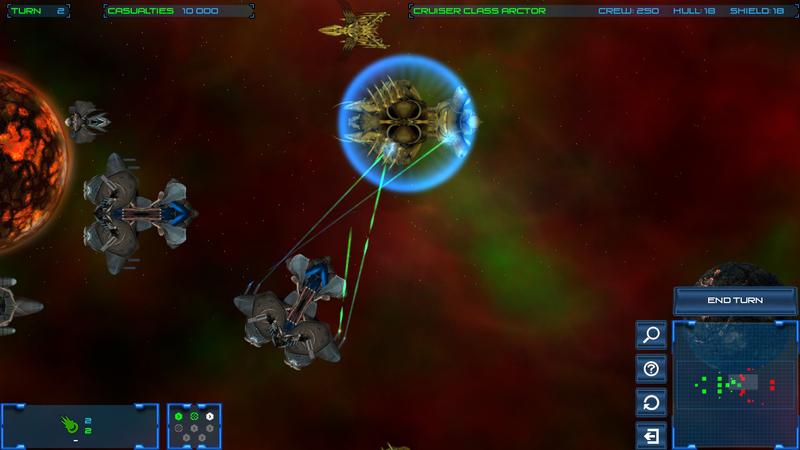 • Tactical turn-based space combat. • Multiple simulation scenarios from covert operations to large scale battles. • Customizable reinforcement to fit your strategy. • Over 30 ships from highly maneuverable fighters to heavily armed cruisers. • Mod ready: Create your own spaceships and scenarios. To have it survive Greenlighting and achieving ultimate victory on Steam all officers are to cast their commanding vote here. Nobody seems to know when actual engagement will begin in earnest, so we'll just have to be ready. Oh man, i missed so much turn-based tactical space combats... Seriously - the last game with this was Master of Orion 2, right? Though its not a strategy game, but i`ll vote for greenlighting it anyways. Human Extinction Simulator is now available for pre-order at the official site, so granting immediate access to the latest beta build of the game. Currently slated for a Q1 2015 release. Human Extinction Simulator has now been released and can be purchased DRM-free from the official site or through Steam.